Aadhaar is the largest biometric identification system in the world, where individuals are provided with a unique 12-digit number which is linked to their biometrics. It would not be an exaggeration to say that in future Aadhaar would become mandatory for availing the benefits of government schemes. Aadhar card serves as proof of address and identity as well. It is therefore essential that all your details and information in the Aadhaar card are accurate. Otherwise, you might not be able to receive the benefits of government schemes. If there have been any changes in your information or biometrics, you must go for an Aadhar Card Update immediately. When do you need to go for an UIDAI Aadhaar Update? 1. When do you need to go for an UIDAI Aadhaar Update? Quality of biometrics captured during enrolment not being up to the mark. The Aadhaar card update process can be completed via two modes, i.e. through an online portal or enrolment centre. While the demographic information can be updated through any of the above two modes, updating biometric data is possible only through the enrolment centre. 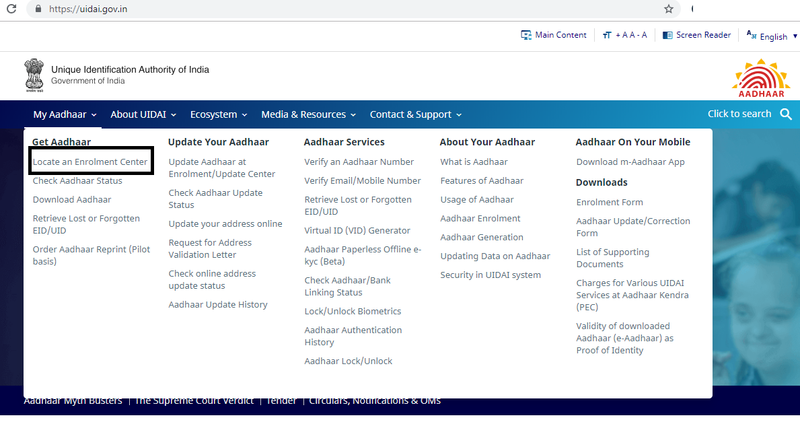 Here is the detailed stepwise guide to help you with the UIDAI Aadhar update. 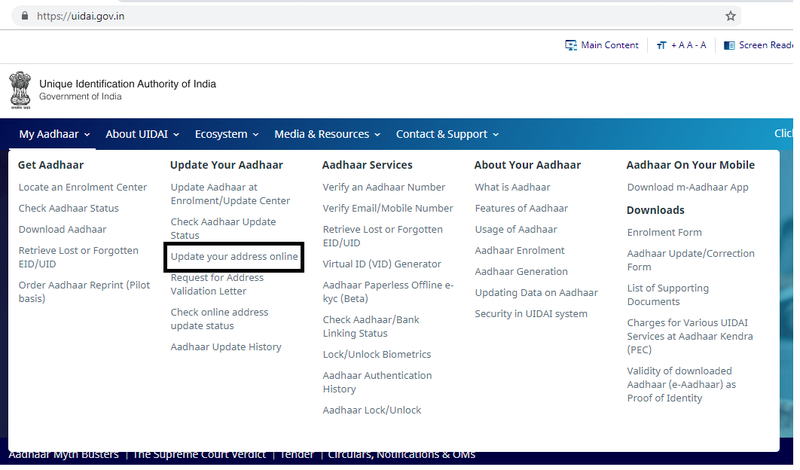 If you want to change or update the demographic data in your Aadhar such as Aadhaar card mobile number update or address update online, you can log-on to the self-service portal of the UIDAI and follow the steps mentioned below for any Aadhaar card correction online. a. Log-on to the official UIDAI website at https://ssup.uidai.gov.in/aadhaar-home/. 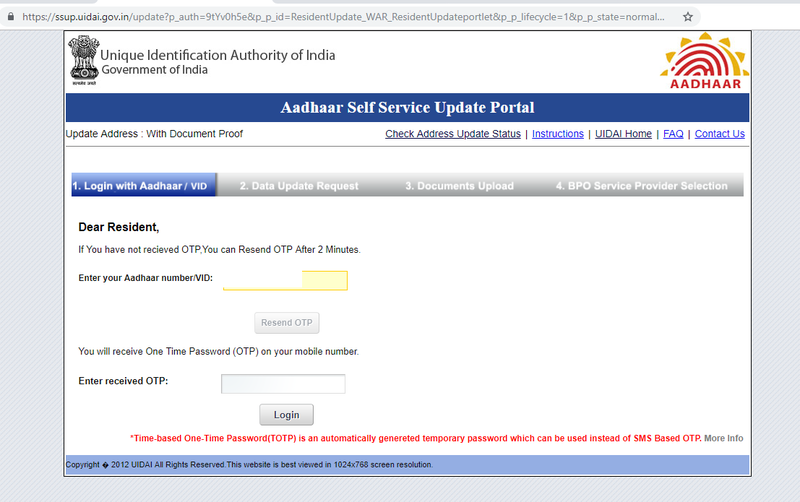 c. On the next page, enter your Aadhaar number and type in the captcha code and click on the button “send OTP”. You will receive an OTP on your registered mobile number. Type in the OTP when prompted. This will take you to your Aadhaar update portal. d. Here, you can select the demographic information that you want to update such as name, address, mobile number etc. e. Now, enter the updated information as updated on the screen. Make sure that you enter the correct and up to date information. Also, check if every other information in your Aadhar data is accurate. If you need to change any information regarding the pin code, district, post office, state etc. you must contact the UIDAI help desk at help@uidai.gov.in. f. After you are satisfied with the details, click on the “Submit” button. This will generate a URN. Note down the URN at a safe place as it will be required to check the Aadhar card update status later on. g. You will now be given the option to select a BPO for your request. Select any of the given BPO and click submit. You can now download the copy of the acknowledgement. It usually takes a few working days for the information to be updated. You can check the status of your update request using the URN on the portal. If your request is approved, you will receive your updated Aadhar card through mail at your address. If the request is rejected for any reason, you will need to re-apply for the same. Find out the nearest Aadhaar enrolment centre through the UIDAI portal. You are not required to make any prior appointment and can visit the permanent enrolment centre as per your convenience. The operator would verify your details and if your documents are in order, and then the operator will proceed with the Aadhaar card correction online. The operator would enter all the details in the software, take your biometrics (if required) and scan the copies of your documents. Once the process is completed, you will get an acknowledgement receipt which will have the URN. You can track the status of the update request against your Aadhaar through the UIDAI portal. If your documents are in order, you will receive the updated copy of Aadhar at your address in a few working days. Getting the information in your Aadhaar Card is extremely important otherwise you might lose out on several benefits that you are entitled to. With the help of the online portal as well as a permanent enrolment centre, the process of the Aadhar card update has become conveniently easy. If you also need to get your Aadhaar data updated, you must act soon and complete the process through the appropriate online channels.